Madison Vilnius Sister Cities, Inc. welcomes everyone – Lithuanians and those of Lithuanian heritage, Baltic neighbors, friends, relatives and members of the general public – to this special event dedicated to The Singing Revolution. It is a modern Baltic story and a story of humanity for all those interested in the strength of the human spirit, nonviolent action and the power of song. The afternoon activities, in the beautiful Wisconsin State Capitol, feature a contemporary choral cantata titled The Singing Revolution, by Kestutis Daugirdas and Rugile Kazlauskaite. The program is free of charge. The Singing Revolution was commissioned to mark the 25th anniversary of Lithuania’s Declaration of Independence from the USSR, the first of the republics to successfully achieve it. The cantata debuted at the Tenth North American Lithuanian Song Festival, Dainu Svente, held in Chicago, July 2015, where it was performed by 1400 singers of all ages – members of professional and community choirs from throughout the U.S. and Canada with guest choirs from Lithuania and London. The singers, seen illuminated in the image below, included two choirs from Wisconsin. The composer, Kestutis Daugirdas, conducted the musicians and large vocal ensemble. Madison Vilnius Sister Cities, Inc. is delighted to welcome Kestutis Daugirdas to Madison where he will conduct this Wisconsin performance of The Singing Revolution in the Capitol’s First Floor Rotunda. The performance will feature 40 singers, including Madison’s choir, Sostines Balsai , and special guests from near and far. The ensemble includes singers from Madison, Milwaukee, Baraboo, Deerfield, Waupaca, Minnesota and Maryland and choir members from Chicago’s Dainava and Kansas City’s Menulio Sviesa, who also participated in the 2015 Dainu Svente. Pianist Sara Roltgen, of Baraboo, will accompany the singers. Dainava is the oldest active Lithuanian choir in the United States, now celebrating over 70 years of existence. Menulio Sviesa organized in 2006 and members have participated in three North American Lithuanian Song Festivals. Though the performance will surely resonate throughout the Capitol’s corridors, those who wish to obtain a program and find a seat are invited to come to the First Floor Rotunda, where the choir will sing. Seating is limited. There is also plenty of standing room. Program guides will be distributed containing the cantata’s lyrics in both Lithuanian and English, and historical background for each of the five movements. The cantata will be sung in Lithuanian. At the cantata’s conclusion, about 1:45 pm, the program site will move to the Capitol’s second floor for an interview with Kestutis Daugirdas. Those attending will be guided to the room. An elevator is also available. Ample time will also be allowed after the interview for people to meet the composer and the singers. This event provides a wonderful opportunity to experience a performance of The Singing Revolution conducted by the composer himself. Also, hear directly from Kestutis as he reflects on his thoughts and experiences creating this evocative work that expresses a powerful story with moving musical motifs and deeply poetic lyrics, characteristically Lithuanian. This portion of the day’s activities will conclude at about 3 pm. People driving to Downtown Madison for the performance are advised to allow ample time to find parking. Saturday May 12th is a Dane County Farmers Market [hyperlink http://dcfm.org/] day on the grounds around the Capitol. The very popular and largest producers-only farmers’ market in America extends all around the Capital Concourse and runs from 6 am – 2 pm. Parking is almost always available in nearby city garages, especially in early afternoon. There is also a parking garage, operated by Dane County, located at the intersection of Fairchild and West Main, very near to the Capitol. When you arrive at the Capitol, use any one of the four major entrances (called wings) and go to the center of the building – the large circular rotunda on the ground floor. Locate a nearby staircase and walk up one flight of stairs to the First Floor Rotunda for the performance (limited seating). An elevator is also available; ask at the Information Desk at the ground floor rotunda. 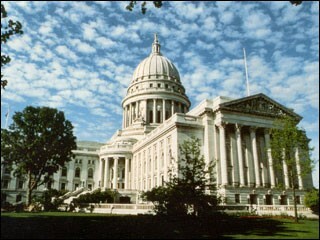 Wheelchair-accessible entrances to the Wisconsin Capitol are located between the wings of the Capitol. There is elevator-access throughout the Capitol, with restrooms on many levels. Kestutis Daugirdas is a multi-talented singer, producer, and composer for choral groups and film. He is coming to Madison from his music studio in Los Angeles for this very special event in a special year. He is Lithuanian-American, born and raised in a vibrant Lithuanian community outside of Chicago where he was immersed and educated in the language, history, songs, choral traditions, and a full complement of other cultural practices. Kestutis graduated from the University of Illinois at Urbana Champaign with a B.A. in Choral Music Education. He is also a graduate of Boston’s Berklee College of Music with a diploma in film scoring. He currently directs a chorus and a men’s ensemble dedicated to performing Lithuanian choral music. In July 2016, he served as guest conductor at the Lithuanian Youth Song Festival in Vilnius with 6,000 singers. He also arranges and sings with The Silver Lake Chorus, an ensemble in Los Angeles. The song “Heavy Star Movin’” from their remix album was nominated for a 2016 Grammy Award. Learn more at www.daugirdasmusic.com. For this cantata, Kestutis worked with Rugile Kazlauskaite, a Lithuanian writer in Vilnius, who conducted archival research and extensive interviews with many people who lived through the events of The Singing Revolution. Skyping across the Atlantic, they created a work that uses Lithuanian musical sensibilities and practices to express rich historical content in a familiar and beloved Baltic cultural format – a choral work for a song festival. The Singing Revolution cantata is comprised of an overture and five movements, each movement corresponding to a year from 1987 to 1991, with each year bringing focus to a pivotal historical event. II. “I rytoju keliame akis” - We Lift our Eyes To Tomorrow Aug. 23, 1988. The greatest Sajudis (Reform Movement) meeting in Lithuania. III. “Baltijos kelias” - The Baltic Way Aug. 23, 1989. Lithuanians, Latvians & Estonians form a 600- kilometer human chain from Vilnius to Riga to Tallinn singing and affirming freedom. The words of the cantata, written in Lithuanian, are beautifully poetic. They describe states of the heart, beliefs, admonitions, hopeful pronouncements, and dire and triumphant situations in concise and elegant language – sometimes using metaphors, always expressing the story. Song is personified. It is an active force that flies on the wind and can tear apart chains of lies. The cantata’s score contains introductory text that provides a description of the historical events upon which each movement is based, written by lyricist Rugile Kazlauskaite and composer Kestutis Daugirdas. For an English translation of that text, click on History & the Cantata. Unable to Attend but Wish to Hear the Cantata? We hope you enjoy the cantata!